Calling all teens to save the ocean! Our ocean is in danger – from plastic, pollution, overfishing and climate change. But thanks to a partnership between Point Defiance Zoo & Aquarium and Seattle Aquarium, local youth can learn and be inspired to help protect it. PDZA’s Zachary Hawn teaches 2017 YOCS teens about marine life. The Youth Ocean Conservation Summit is a one-day event from 9:30am-4:45pm on November 17. Held this year at Seattle Aquarium, it inspires local youth to take action in their communities by creating projects that promote conservation of our marine environment. 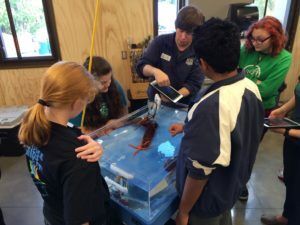 Students will learn from local experts and work with fellow youth to develop the skills and resources necessary to plan and execute their own ocean conservation projects. The summit will feature a keynote speaker, talks from youth who have led their own conservation projects, and workshops led by experts on a variety of topics including volunteer coordination, community outreach, grant writing and funding, government advocacy and more. Participants will leave with an action plan to carry out their own conservation projects in the community. Following the summit, attendees will have the opportunity to apply for grants of up to $200 to help fund their conservation projects. Participants at the 2017 YOCS at Point Defiance Zoo. 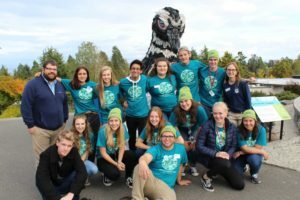 The Youth Ocean Conservation Summit is co-hosted by youth volunteers from Point Defiance Zoo & Aquarium and the Seattle Aquarium. In 2017 it was held at Point Defiance Zoo & Aquarium, and will be again in 2019. Open to all youth in grades 7-12. Cost is $10, but need-based scholarships are available. Please contact aquateens@seattleaquarium.org to request a scholarship. Register here by Nov. 16.